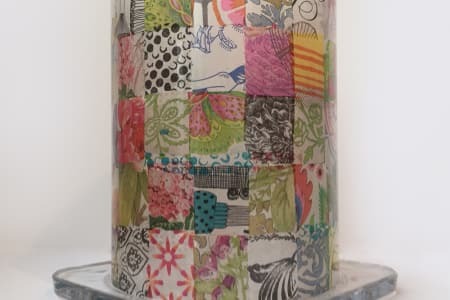 A fantastic session creating a decoupage storm lamp. Gabriela was really helpful as applying the decorative elements to the inside of a glass curve is much harder than it sounds! I also had time to decorate the glass base. Unfortunately my daughter loved the storm lamp so much that I had to give it to her, so at least I'm now fully informed on how to make another for myself !! Absolutely brilliant class with the added benefit of a phenomenal lunch. My Frida has been everywhere with me since! I achieved so much more of a complex piece than I thought I could have done in the time allowed. Thanks Gabriela! Thank you Gabriela for a lovely few hours making a decoupage picture frame. 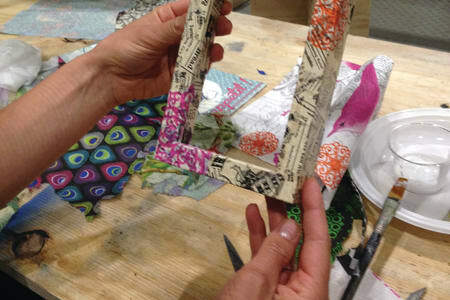 The picture frame is an ideal project for a first attempt at decoupage. I was really pleased with my finished piece but I mostly just appreciated the chance to try out the technique in a relaxed studio environment. My beautiful chair is eye-catching and all my guests have commented on how beautiful it is. I still contemplate it myself.I definitely recommend Gabriela's workshop. I have learnt a great deal, the atmosphere was very friendly and the venue too is worthy visiting. Really loved this workshop and Gabriela was an amazing host and teacher. 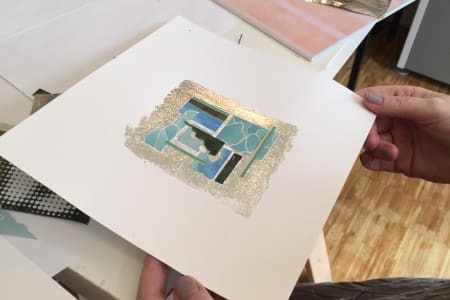 She explained the process of making a collage thoroughly and allowed sufficient time to test different acrylics and techniques. And always willing to offer a helping hand or word of advice. I did a tray decoupage workshop with a group of friends. Gabriela is a friendly and inspiring teacher and it sparked an ongoing interest in the technique for me. Her studio is a lovely place to work and has lots of examples of her own work too. With lots of tea and cake along with the class, what's not to like! A fantastic afternoon decoupaging a pair of shoes - I mean, who knew that was even a thing, right? You supply the shoes, and Gabriela supplies everything else, including decent coffee, choco Liebnitz biccies, and a wicked soundtrack. 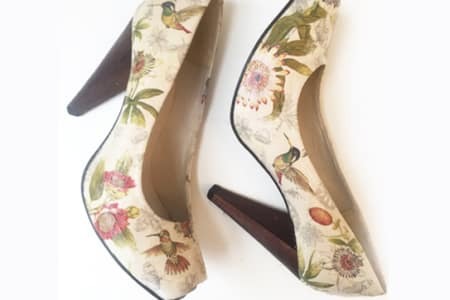 I started with a pair of boring beige pumps, and left with a unique pair covered with vintage maps. Definitely going to go back to do something else there. I loved the class. Gabriella was welcoming and has a beautiful studio decorated with amazing examples of her art works. I had an unusual project in mind, which was going to be a challenge, but Gabriella worked with me to make it happen. 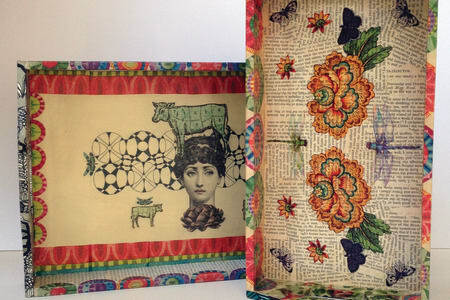 Gabriela's decoupage class was brilliant - it was informative and relaxed and she was very generous with her materials. I would definitely attend another one of her classes. It was an exceptional workshop delivered by Gabriela. She was extremely kind, welcoming and so were the other people doing activities there. I picked up new skills, especially to do with prepping and maintaining a good technic. Gabriela was so knowledgeable and her passion about decoupage was very contagious. 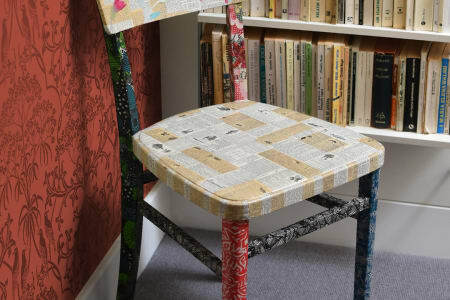 For anyone who likes learning new DIY skills and wit special interests in upcycling, this is the perfect workshop to go. I’ll definitely go back! Gabriela was amazing. She was so supportive, full of ideas. The lunch and snacks were great too, way in excess of what I would have expected. It was such a treat of a day and a great opportunity to immerse oneself in a project, supported by expert advice and leave the external world behind. A very therapeutic experience for anyone regardless of experience. Fantastic workshop, really lovely studio, absolutely loved it. I thoroughly enjoyed the upcycling furniture course. It was very informative and i learned so much. Gabriela Szulman is an excellent tutor and takes time to explain each stage of the course. I would love to attend a future course. This was such a great class! I worked on a little coffee table which I covered with a world map pattern and pages from old books. I only did one day and it was non-stop even with a small piece of furniture, so that is something to keep in mind when you book. There were a couple of people in the class who were on their second day of working on chairs and they also left with lovely finished pieces but it took them the whole two days to get there. I appreciated being in a small class with plenty of individual help, and found it interesting to see how different all the results were given that we were all using same materials. Wonderful studio and really helpful teacher. Plus healthy lunch and lots of snacks to keep you going during the day! Recommended. A great class, I highly recommend, I've taken a few of Gabriela's up-cycle workshops and keep returning, I really enjoy it, and Gabriela makes you feel most welcome the studio is a great environment with nice pieces to also inspire you, plus you get to take home your lovely design I plan to return again :-) Decoupage is a really great. I've been to various workshops at Gabriela's studio and I enjoyed all of them. 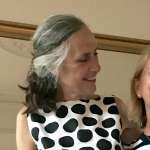 Gabriela is wonderful and really good at introducing you to new techniques, very patient and great at helping you explore your creative side. I highly recommend to take The Storm Lamp class as you not only will learn but you will you leave with something you can truly be proud of. Wonderful workshop in a very warm, creative space. Gabriela is an excellent teacher patient and encouraging - the hours flew by, I would have been happy to stay all day. 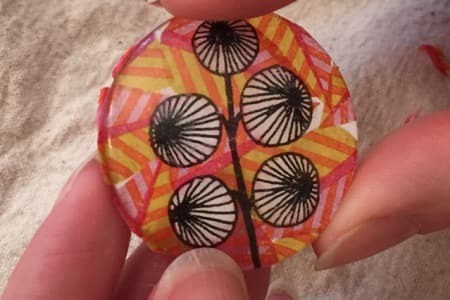 Living in such a fast paced city it is great to be able to slow down and focus on decoupage. The storm lamp has been much admired. This is the second course I've done with Gabriela. Her studio is a lovely place to work, full of interesting things. 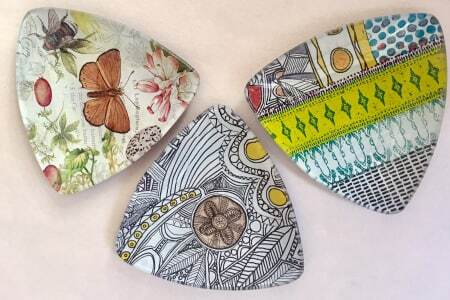 She teaches in a very clear and supportive way so you leave feeling you have really learnt how to decoupage. Classes are small so you get plenty of attention and help. The storm lamp was a different decoupage technique - a little bit fiddly but the end result is amazing. I've had a lot of compliments on my finished item. This was a very enjoyable course. I was totally new to decoupage and although interested in art I had never done any practical art since leaving school, many years ago! Gabriela was a fantastic tutor , kind , helpful and encouraging. The whole process lasted all day and so calls for concentration and application but the time literally flew by! Her studio/ home is delightful a gallery in itself. We were made to feel very welcome and she provided a wonderful luncheon for us. She is an interesting host and I thoroughly recommend this course to anyone considering it. 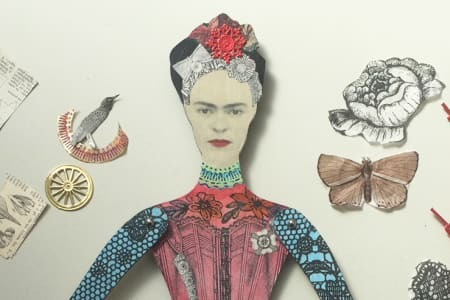 My daughter and I took home wonderful Frida Kahlo inspired dolls to hang on the wall and we will certainly be returning to do another of Gabriela's courses soon. 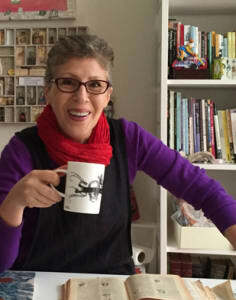 Last Sunday I was in a full-day Frida's workshop on Gabriela's studio. Great experience from start to finish. Gabriela was a great teacher showing the decoupage and painting techniques. The group was small which was great because everyone received individual attention and support. Gabriela is super patient and enthusiastic and her studio is incredible, every corner is very inspirational. Last but not least, the food experience was "a m a z i n g" homemade cook, healthy and tasty, authentic mexican tortillas, great salads an vibrant margaritas! . I would definitely recommend doing this workshop with Gabriela! Really enjoyable workshop and lunch was delicious. Gabriela's studio is an amazing space to work in, the group was small so we all received a lot of individual support and attention. My daughter and I were really happy with the Frida Kahlo dolls we had made. We would definitely recommend doing this workshop with Gabriela. This class was fantastic! Without having experience I was able to make a beautiful piece which I took home. Gaby is an excellent (and patient!) teacher- would definitely recommend!! 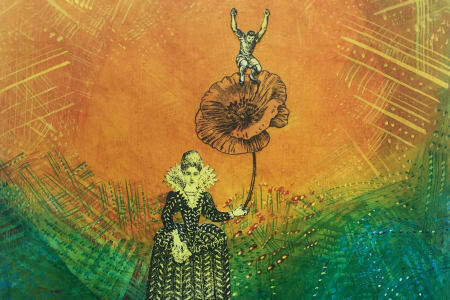 I have attended a number of courses for various different hobbies, but the Collage and Multi Media with Gabriela is one of the best and I will be returning to do it all over again. A lovely atmosphere and Gabriela is so helpful - I really enjoyed by day. I never considered myself naturally creative so I was very unsure about how I would go at this workshop. Right from the start, Gabriela created a relaxed and friendly atmosphere, and provided really clear and helpful guidance to get me started. Gabriela provided a fabulous range of materials, and had an excellent knack of drawing out my own ideas and inspiration and then advising on how I might best give effect to them, as well as making her own creative suggestions. Gabriela was on hand through out and provided a really high level of individual attention. She stayed completely calm - even when things didn't go quite as I planned - and was really reassuring and encouraging. I was absolutely delighted with my final piece - it far exceeded my expectations of what I might be capable of - and that is due in no small measure to Gabriela's expert input and tuition. It was one of the most absorbing, interesting and fun workshops I've done, and my piece now hangs proudly on my kitchen wall. I cannot recommend Gabriela's classes highly enough. I did the full day workshop with Gabriella Szulman recently (I had earlier done the half day decoupage workshop and enjoyed it so much I came back to do the full day workshop) Gabriela creates a relaxed and safe environment to learn and experiment, all the while supported by Gabriella both from a technical point of view (materials, tools, techniques) as well as an esthetical PoV (what looks good, how to improve things) and has lots of examples and materials available to be inspired by. Many thanks Gabriela! Lovely begginers course! You learn to transform a plain wooden tray into something beautiful all your guests will compliment! It was a fun day surrounded with lovely people and good to disconnect while doing somethig creative - and useful! Would highly recommend!! I loved it, it turned out to be such a great gift too! I look forward to the next one I do soon. This course is outstanding! - and ideal to create an origina gift for some loved one! Original, fun and creative! Gaby is an excellent artist. She is professional and goes step by step with you in the process. I did a lovely necklace which I gave to my sister as a birthday gift and she loved it! Would definitely recommend!! I arrived with a pair of favourite but rather tatty and worn boots, and left with a very funky pair covered in a purple and pink Marimekko pattern. Difficult to believe that paper can be used to upcycle shoes but it works really well, and whenever I wear my boots people ask me where I bought them! The class was very relaxed and the studio is beautiful, with a lot of Gabriela´s work on display and inspiring bits and pieces. I appreciated the coffee, biscuits and fruit as it is a long class! Gabriela demonstrated every step of the technique and she also gave us one-to-one help, which was much appreciated. I will be coming back to learn other things at this studio soon, highly recommended class. Loved this course!! Recycling shoes! Is’t it a wonderful idea? Met fabulous people and Gaby is an excellent artist and teacher that gives you all the tips for you to learn the technique! Left witha beautiful and orginal pair of shoes! Would highly recommend and will certainly take another class with Gaby!